Teletower offers an efficient and lower-cost alternative to other low level access platforms. With seven different platform heights: From 0.33m to 2m at 25cm increments. and it has an internal ladder which makes it ideal for use in zone 1 areas especially when experts need to carry out electrical work safely. 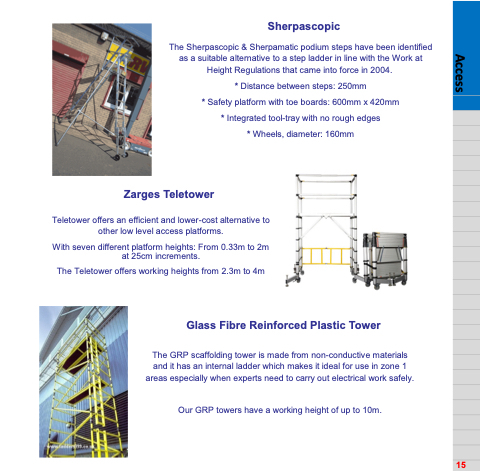 Our GRP towers have a working height of up to 10m. The Sherpascopic & Sherpamatic podium steps have been identified as a suitable alternative to a step ladder in line with the Work at Height Regulations that came into force in 2004.